Ladies and Gentleman, here’s what I got for you this weekend. Plenty of Fighting Games, with Frosty Faustings XI, and Glitch 6 is bringing up the rear with Smash, just to name a view. We got CS:Go majors, A lot of League of Legends, Rainbow 6 siege, Overwatch, Rocket League, Call of Duty, Splatoon, even Heroes of the Storm... Goodness, it’s quite a packed weekend. 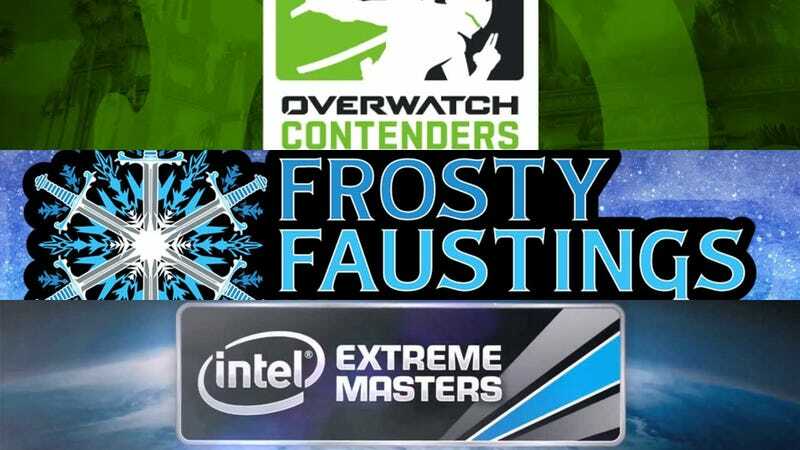 Frosty Faustings is back for another FGC major. Friday and Saturday. I don’t know what happened. These two day events are usually on Saturday and Sunday. But oh well, that just means you get to watch sooner. A large smash ultimate event happening at Xanadu games. Over 600 participants. High School and College Smash players. This is the best they could do. The Counter Strike super major returns with season 13. We’ve got minors happening in all 4 regions. The games in Europe and CIS regions are already underway. While the Americas and Asia will run throughout next week. Playoffs come to an end this weekend on Sunday.